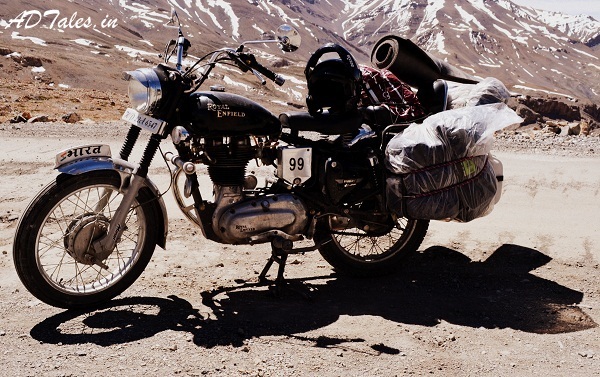 Home » Traveling » How to prepare bike for LEH Ride ? How to prepare bike for LEH Ride ? 2. Get the rims balanced (this will prevent breaking of spokes and unnecessary wobbles that could spoil your bikes ride and handling). When you are getting your wheels balanced make sure that the spokes are not protruding from inside the rim. If they are they could puncture the tube from inside. After this, ensure that there is a rubber strip (good condition) around the inside of the rim. When you disassemble the wheels check the wheel bearings as well. 3. Inspect and make sure that your bike has only genuine OE parts, especially hubs, spokes, rims and other engine components. We cannot provide support for modified items and in such case you are requested to carry your own spares. We can make arrangements to carry them in the service truck. 4. Get your shock absorbers inspected. They should be in top working order. Check the bushes for the rear shock absorbers and replace if necessary. 5. Check condition of front fork oil seals and replace if needed. Make sure that there is no crack on the fork bottom tube. If your springs have sagged or your main tube has worn out get them replaced. 6. Check the rear swingarm bush and replace if needed. 7. Check your chain and rear sprocket for wear. If you find that there are less than four notch adjustments to go on your chain adjuster cam, replace your chain and both your sprockets. 8. Your bikes clutch is really crucial for this trip, so make sure that your clutch is in good order and adjusted properly without the trace of any drag, slip etc. When you open your clutch cover, also check the primary chain and the adjuster. Do not use any kind of additional insert under the chain adjuster. If the adjuster has reached its limit replace the primary chain. 9. Check your battery and the earthing connections. If you have any history of electrical trouble, be sure that the problem is completely solved. The water, vibrations, dust and maybe snow that riders are likely to encounter on the route could further accentuate existing problems. 10. Check for play in the steering column and replace the ball race bearing if necessary. 11. Check all the rubber components like carburettor hose, fuel lines, air filter rubber etc for cracks and tears and replace if in doubt. 12. Check all cables and if found bent of frayed, replace immediately. Do not use oil in friction free cables. 13. Finally tighten all the nuts and bolts and if it is found to slip or the threads are damaged replace the relevant parts. This is a very crucial part. If your bike is working fine let it be. It would be a good idea to do a weekend trip to try it out and see how it behaves. It would be a good idea to ride a new bike and make sure that your bike is up to the mark. If there is any doubt please visit your showroom. Do not leave the fixing of your bike to the last min and start the trip with an untested bike. It is Critical for each Rider to know his/her bike’s fuel or oil consumption. While you are preparing your motorcycle it is a good idea to learn some basic service, for instance: tube changing, chain tightening, cables adjustment/ replacement, cleaning spark plug & air filter, pushrod adjustment, replace fuse & bulbs and top up/change engine/gear box/clutch oil. Normally I don’t learn article on blogs, but I would like to say that this write-up very compelled me to check out and do it! Your writing taste has been amazed me. Thanks, very nice post.